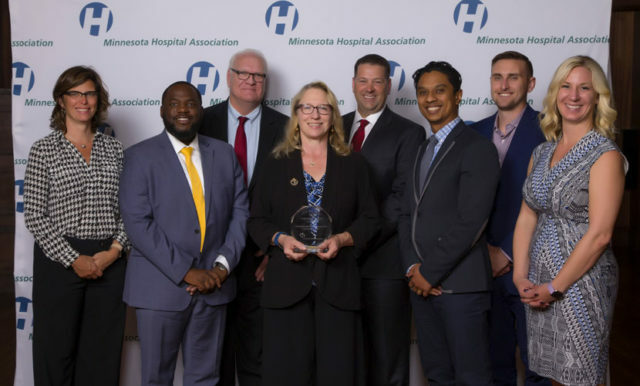 North Memorial Health received the 2018 Community Benefit Award for North Market from the Minnesota Hospital Association (MHA) at a ceremony on Friday, June 1, 2018. This project is an innovative partnership between Pillsbury United Communities and North Memorial Health. Located in North Minneapolis, North Market is a grocery store and wellness center that seeks to meet the nutritional and health needs of the surrounding community. North Market opened in December 2017. The grocery store offers affordable and healthy food. The Wellness Resource Center, which is operated by North Memorial Health, offers free non-medical services, focused on educating customers about their health and connecting customers with additional community resources. Wellness coordinators, nutritionists, community health workers and pharmacy liaisons are located on site to provide information and referrals including health assessments, nutrition guidance, insurance and scheduling assistance, and medication management. North Market is located at 4414 Humboldt Avenue N., Minneapolis, MN.